The township of Lockport, New York is a unique little spot. If you’ve been to Seattle, Washington you might have seen the “locks” and maybe even been on some floating excursion and experienced how they work. Well upstate New York has a much smaller but no less impressive lock system. One that has been there for a while. This pick is looking up as the water is descending in the canal. 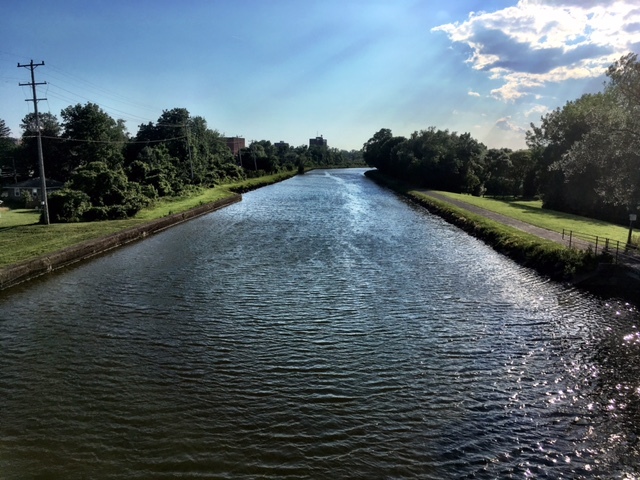 Kind of Eerie…no pun intended (Eerie Canal!). My sons and I took a river boat ride up the locks and down the canal. Then the boat returns and you get to go down the locks. It was a peaceful but fun adventure. Seeing greenery as you progress down the canal see the sights from different perspectives is always a joy to me. It is an amazing feat to see so much water raise your vessel up and reverse when lowering. The little town of Lockport is a cool little pass through spot. I enjoy seeing things that are unique and you will find it here! I have been to the Panama Canal where I experienced the locks you describe. Quite an amazing degree of engineering involved.